After an absence of almost three decades, conceptual sculptor and California native Robert Kinmont started making work again in 2005. Marking his reemergence, yet inextricably linked to his early practice involving earthy materials and koan-like gestures, is Kinmont’s current solo exhibition at Alexander and Bonin in New York, surveying works from 1964 to 1975 and from 2005 to 2009. 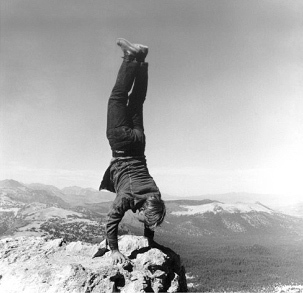 The image to the left is the first in a series titled, 8 Natural Handstands, 1969. In her essay for the exhibition, Julie Ault responds to the action: “His straight graceful form appears effortless, despite being inches away from a substantial plunge. The image… elicited contradictory impressions of gravity and airiness, serenity and adventure…” More than forty years later, it’s also warmly nostalgic. Kinmont’s action brings to mind two other works of the same era: Piero Manzoni’s Socle du Monde, 1961 and the Untitled, 1973 photograph of Charles Ray, bound to a tree branch. Kinmont is neither framing all the world as his art, nor staging an act of endurance in the landscape. Yet, if we step back from this one gesture to consider the language of his artistic practice in general, both start to make sense. 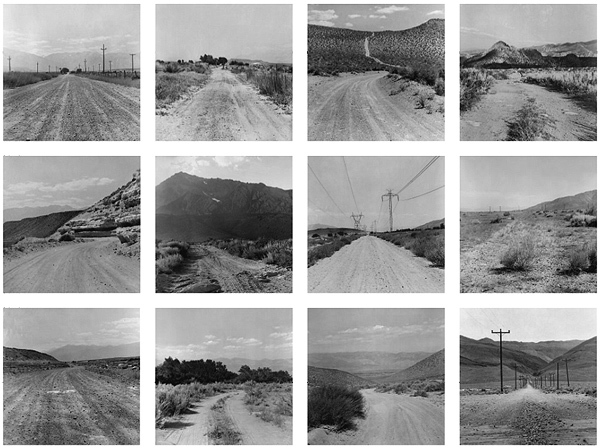 Ault identifies his sympathies with the landscape of California as central to his practice. Kinmont both grew up and spent much of his adult life in eastern California, in a small town called Bishop (6 hours east of the Bay Area), the “geological meeting place of high desert, pine forest, and High Sierra.” Ault pronounces, “the acute desert topography of Bishop is Kinmont’s muse and has proven over time to be a formative context and endless foundation…” While Kinmont’s early work has the dusty entropic atmosphere of Land Art, it also shares some of the structural tropes of Conceptualism. Numbering and repetition inflect meaning in many of these early works. One thing Ault overlooks, is the influence of the legendary faculty at the University of California, Davis—the program that graduated Bruce Nauman only a few years prior to Kinmont’s arrival. Nonetheless, Ault’s essay makes a strong case, and offers keys not only to Kinmont’s work but to his way of life. This is my favorite dirt road. It goes up to Buttermilk and is mostly washboard and straight. It’s a modern dirt road, wider than most dirt roads. You can do fifty miles an hour on it. It’s sandy on the sides. I learned to drive on it and we used to go up it in the winter to count deer and hunt cottontail rabbits. I’ve ridden a horse up it and walked down it and lost a wounded deer by it and watched miners set dynamite charges to improve it. I’ve looked for chucker partridge, shot at quail, doves, done water colors of the rocks beside it under the trees over it, know one of the only unclaimed springs by it and watched mountain lions run away from it. It leads to a road that goes to hanging valley mine behind the top of Mount Tom, to Horton Lakes, to the artists’ cabin, to the beaver ponds, to the place where they count deer in the winter, to the cattle guard, to the miners’ cabin, to the top of the sand canyon, to the Basin Mountain Mining road, to the Rocking Chair Ranch, and starts from one of the only recorded spots of a battle between Paiutes and Whites, almost exactly where the stream that crosses the desert from Bishop Creek leads to the ranch where I grew up. Lovely piece. Two Kinmont works that engaged viewer involvement were featured in a four-man SFMOMA show (with John C. Fernie, Tony May, Jim Melchert) as part of the “Arts of San Francisco 1971” series. Sit on the Floor, 1971; Wood school desk without legs and with “Sit on the Floor” engraved on the lid. The desk is filled with sagebrush and sits on the floor. The ongoing task of resuscitating the work of California conceptualists of the 70s is vitally important. Glad to see this Joseph. Wonderful to see Bob’s at it again!!! i think that robert kinmont is fabulous. i remember him. he was a great teacher and a great friend. thank you, joe price. Hi Bobby, I had some classes with you in Bishop High School. Long time ago…I also do artwork;just for fun and share with friends. I live in Orlando,Fl. now,but have many fond memories of the natural beauty of Bishop…Mammoth (where I learned to ski).I have several photos of Mt. Tom. My daughter,Rhonda, was born there in 1956.Look me up in facebook. It’s really wonderful to see Bob Kinmont’s work again receiving critical acclaim & recognition. He is a great California original artist who has long been admired & appreciated! That was the Rocking-K Ranch in Bishop, and we skied together with Bob and brother Jerry, when Dave McCoy had just eleven rope tows at Mammoth. A big Thanks to all those who have helped bring critical attention back to Bob Kinmont’s important Art! We served our country together in years 1960-62 where Robert earned respeect from his fellow solders by his perspective of life from all things created past present and future. I would love to cross trails someday again.